Pretty nostalgic vintage kitchen wall clocks that remind you of the yesteryears would certainly look great in your retro themed kitchen. Vintage color, vintage design, the funky retro wall clock instantly adds a touch of old fashioned charm and warmth to your kitchen. The retro kitchen wall clock that hangs in a little retro corner takes you back in time filling you with fond memories of events long past. Vintage retro kitchen clocks give you a sense of familiarity. You may have seen these type of old school clocks before, maybe in your grandparents’ house or your aunt’s place. You feel comfortable and at home. 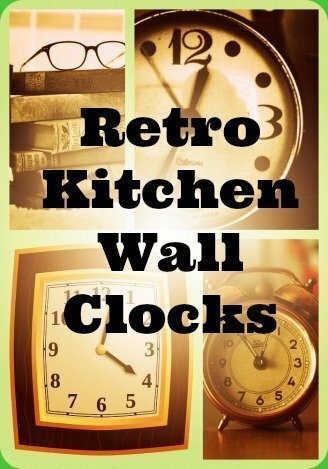 Vintage kitchen wall clocks make lovely gifts for retro lovers or as retro housewarming gifts, wedding gifts, Christmas gifts etc. The retro round wall clock reminiscent of the fifties era normally has large easy to read numbers. This retro style clock will not look out of place in the modern kitchen. Whether it’s a retro kitchen wall clock with timer or pendulum, it does bring about a nostalgic feel into your kitchen. Some people find the old fashioned clock with its gentle pleasant chiming/ticking sound soothing and helps in relieving stress. You won’t get this from the modern electronic clock with its silent operation. Retro wall clocks for kitchen are cute and pretty too. Complement your shabby chic kitchen decor with these lovely old fashioned wall clocks. This 3D colorful clock is like a beautiful piece of vintage style artwork when hung up. It is made of heavy gauge American steel and the graphic is powder coated for a long lasting effect. Handmade in USA, it comes ready for hanging. You’ll have to standby 1 AA battery (buy separately) for it to work. The vintage inspired wall clock measures 12″ x 12″. Exuding lots of retro charm, this round face old style wall clock has matching green hands and a silent sweep (no ticking sound) second hand movement. Its light green dial face is protected by a convex glass lens. It measures 2.75″ in depth and has a 9.5″ diameter face. It has a weight of 1.2 pounds. You need 1 AA battery for it to work (not included). This lime green retro wall clock is really so yesteryear, so common during the 1950s. You can also get it as a red retro clock. It is also available in white or silver. Measuring about 13.4″ in diameter and about 2″ in thickness, this shabby chic vintage style wall clock requires 1x 1.5V AA battery (not included) for it to work. The big bold numbers as well as the black hour and minute hands make it easy to view the time. It is made of MDF (medium density fiberboard) wood covered with paper laminate finish. It comes unframed without any front glass cover. A clock for rooster lovers, this old style clock with the ‘wake up’ call would look lovely hanging on your kitchen or bedroom wall. Made of MDF, this wall clock requires 1 AA battery (not included) for it to work. A cute and adorable smiling chef holding a retro clock would look lovely on the kitchen wall. This European style resin chef vintage style clock brings with it a sense of humor and nostalgic memories. It measures about 12″ in height and 10″ in width. This lovely beige yellow retro kitchen clock has a built-in 1 hour timer for cooking as well as a room temperature gauge. This large retro wall clock with metal case measures about 13″ in height and 9.5″ in width. The black hands and black second hand against a white dial surface allow for easy reading of the time. It helps too that the numbers are large. Hang it up on your kitchen wall for some 1950s vintage charm. 1 AA battery (not included) is required. A decorative wall clock with the antique look, it has large black numbers and black pointed hands. Fine details such as beautifully crafted flowers add to its vintage elegance. It is powered by 1 AA battery which you have to buy separately. This beautifully crafted vintage inspired kitchen wall clock measures 12″ x 23″. This clock would make a very lovely wedding gift, mother’s day gift, Christmas gift or housewarming gift. This red retro kitchen clock with timer has a white dial surface covered with a convex glass crystal lens. It has a red plastic body and comes with black metal hands that makes reading the time easy. It measures 12.3″ from top to bottom and has a width of 8.5″. The clock face has a diameter of 6″. It doesn’t come with a second hand. The built-in 1 hour timer for cooking is a useful feature to have especially if you bake frequently. This vintage wall clock for kitchen is also available in turquoise, chrome silver and black. This rustic clock comes with an antique face and in distressed colors that looks aged with the years. It is made of iron with a distressed aqua finish. Measuring 15.4″W x 2.6″D x 15″H, it requires 1 AA battery (not included) to operate. This 50s inspired kitchen wall clock comes with a large face and easy to read black numbers. This red retro clock with quartz movement measures 9″ x 9″ with a depth of 1.88″. It needs 1 AA battery for it to work (not included). It comes with a second hand with color that matches its metal case. Besides red, you can also get the square frame in green color. Nostalgic vintage kitchen clocks are functional and decorative. In fact, you can use them to decorate any retro themed room in your house.